The techniques Nicole Walger uses to create her jewelry leave clearly visible marks on each piece. So her rings, for example, look as if a specific moment of creation, i.e. of the crafting process, had been captured and frozen in time. 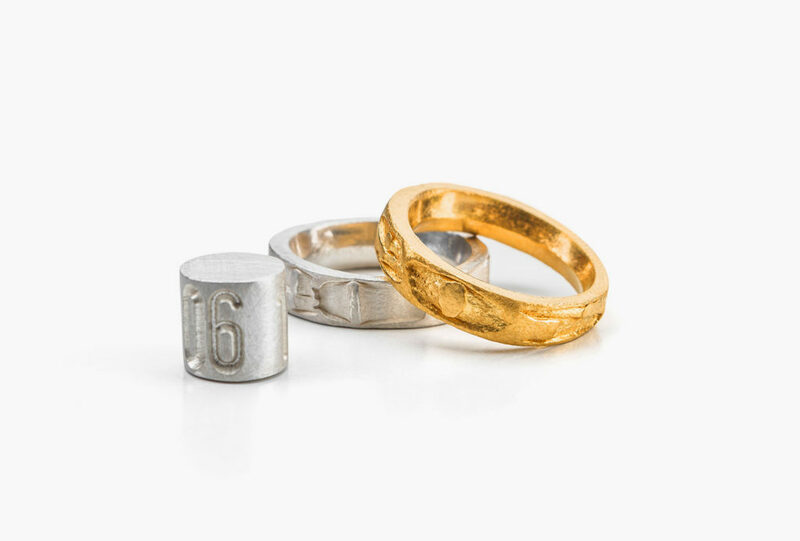 This idea also inspires her to create particularly captivating wedding rings, such as the pair entitled Together, which has been crafted from one single piece of metal. While the beholder’s main focus will always be on the material – usually gold or silver –, the individual pieces’ forms and surfaces reveal the forces involved in the creative process. Erdreich [soil] rings. Gold 900. Casting process for the Erdreich [soil] rings. Erdreich [soil] rings. Gold 900 and silver 935. Wedding rings Goldstück [jewel]. Fine gold. Wedding rings für dich für mich für uns [for you for me for us]. Fine gold. Wedding rings Datumsring [date ring]. Fine gold or fine silver. Wedding rings Zusammen [together]. Fine gold or fine silver. Wedding rings Für gute und für schlechte Zeiten [for good and for bad times]. Fine gold.